Joyce Wycoff Connecting through Art: We're all the same. Last night I was part of a love affair. 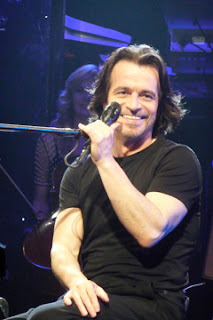 It was a Yanni concert and love was definitely in the air ... between Yanni and his musicians and between us, the audience, and Yanni and the musicians that played as if they were having the time of their lives. In some concerts a magical sense of connection happens ... this was one of them. Maybe part of it was that we wound up front-row, center stage and could see every nuance of his facial gestures and those of his musicians, including Charlie, the drummer, who thrilled the audience when he stood up with a Fresno Bulldogs t-shirt on ... and played one of the longest, most exciting drum solos I've heard for decades. Perhaps the biggest thrill for me was when Yanni repeated, in his deep, Greek-tinged voice, his statement from "Live at the Acropolis,"
Great opening line to your post! It's been ages since I've heard Yanni. (He still has that incredible head of hair.) That must have been a wonderful concert. Like Maureen -- it's been years. thansk for sharing his passion and his song with us.